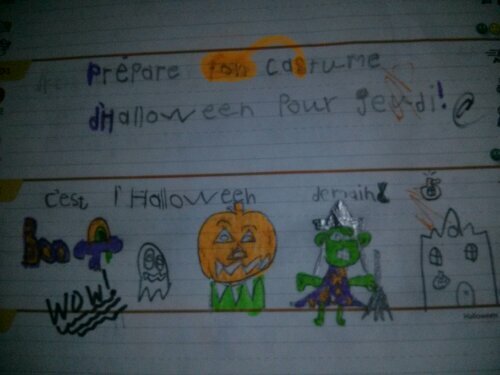 I love that our daughter’s grade 2 teacher gives the students time to doodle in their daily agendas! 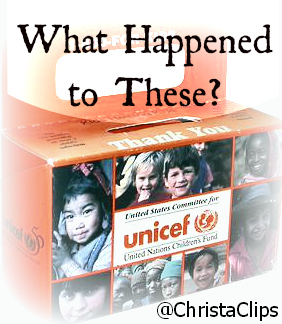 What Happened to the UNICEF Hallowe’en Coin Boxes? This is the Unicef Hallowe’en box from 1980. I was 7 – the same age as my daughter is now. I likely didn’t appreciate the value of those UNICEF Hallowe’en coin boxes as a youngster, but I suspect that the seeds for my Save-at-Home-Mom mantra “it all adds up” were, in part, planted in my mind thanks to the various charity projects that my parents pushed my brothers and I to participate in. That sense of belonging to something “bigger” when my classmates plunked down their boxes, too, burns bright in my heart and I was really looking forward to sending my own children out there with their own UNICEF Hallowe’en coin boxes when they reached school-age. Sadly, the boxes are no longer. “people just weren’t giving coins anymore”. On the contrary! Even in recent years with coins being less common in our households, teachers and volunteers spent hours of their time rolling the thousands of dollars in coins that were collected. One UNICEF rep shared the scoop that the heavy coins actually broke some of the transport trucks enlisted by UNICEF to collect the rolled coins. Can you imagine?! I am writing this blog post, somewhat “outside the box” of my usual budget hacks and savings tips, to challenge you to buy one of the Survival Gifts with your friends, family or colleagues this month to capitalize on the nostalgia of the UNICEF Hallowe’en coin boxes. Consider collecting coins at your Hallowe’en party this weekend! Are you going to a Hallowe’en party this weekend? Consider collecting coins (especially the ones with ducks and polar bears!) and ordering something from the Survival Gifts catalogue in honour of your fellow guests! Collect coins from your party guests and buy your meaningful gift on-line right then and there! Or look through the catalogue ahead of time and purchase a Survival Gift in lieu of a hostess gift! What a great way to keep the spirit of the coin box alive, and to pass on the sense of being part of something “bigger” to our children. Join me in keeping the tradition of giving to UNICEF at Hallowe’en alive and strong. Disclaimer: I was not reimbursed or commissioned by UNICEF to write this blog post. They have, however donated 1 tetanus vaccine in my honour in exchange for my e-mail address and phone number. If you would like to have a vaccine donated by one of the UNICEF partners in your name, visit unicef.ca by October 31st. Afterall, it’s #UNICEFDAY !